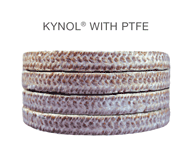 Kynol® phenolic fiber yarn impregnated with PTFE suspensoid and proprietary inert break in lubricant. Non Abrasive – reduced wear on sleeves. Wide pH range: less inventory. Style TB 210 is a versatile compression packing for use in pumps, mixers and agitators in medium speeds and a broad range of acids and caustics. In valve service, the flexibility of the braid lends itself to applications such as large knife gate valves used in Pulp & Paper.